The refurbishment of Grenfell Tower, in which 71 lost their lives in the June 2017 fire, was signed off by building control managers at the Royal Borough of Kensington and Chelsea council in 2016. However, if the report by the Times is correct, the cladding system never underwent mandatory safety testing. 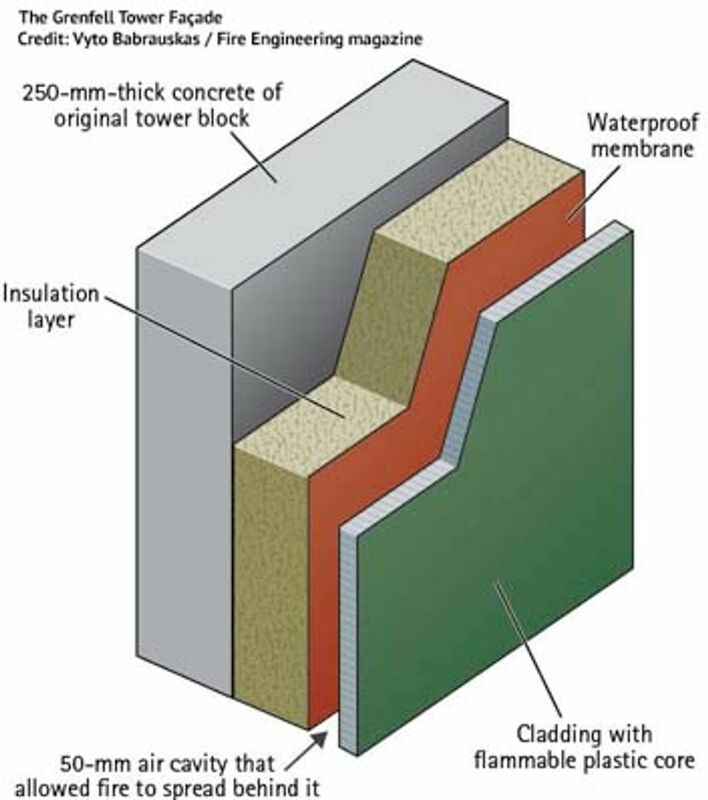 An article in Fire Engineering magazine, published for nearly 140 years to “provide training, education and management information for fire and emergency services personnel worldwide”, concludes that a major factor in the spread of the fire at Grenfell Tower was the large size of the air-gap between the external cladding and the insulation layer attached to the building façade. Schylter had found that an air-gap of 25mm (1 inch) provided the optimum spacing to promote upward flame spread in a cavity. At 50mm (2 inches), the gap at Grenfell Tower was twice this width. In the late 19th century, the first high-rise buildings had façades made of concrete, stone, brick, steel or glass. There was no need of a test for combustibility since these materials are inherently non-combustible. The situation changed 30 or 40 years ago with the introduction of “exterior insulation and finish systems (EIFS).” These are generally cheaper and often employ combustible materials with only a thin protective aluminium skin, which can soon melt in a fire. Non-combustible insulation alternatives, such as mineral wool, are available, but cost more. After the Grenfell Tower fire this is incontestable. For the sake of saving a few thousand pounds, an inherently unsafe form of cladding was used on a building without a proper fire warning or sprinkler system, and with inadequate escape routes. Culpability extends from those responsible for proposing such cladding, to the local authority for signing off on its use, and the building contractors for fitting such dangerous materials. The lack of a rigorous testing regime, despite known contributing hazards such as the Schylter effect, points to a criminal conspiracy at the heart of what are supposedly called “building standards.” These exist primarily not for the protection of the public, but to enable the use of the lowest cost materials and hence the greatest profits for the construction giants and property speculators. I think there were many more than 71 deaths. Possible, as some survivors whose relatives died may have been afraid to be deported. I think it was many hundreds. I see this story has gone viral …. Do you know where it was reblogged? on my blog … I had huge traffic to the reblog.